ELGIN, OK (KSWO)- Elgin Middle School's annual Winter Wishes program is officially underway. Over 750 donuts were given out to students on Thursday to spread kindness and jumpstart the week-long event. Each student makes a wish for themselves and makes a wish for another student. The community works with the school to make those wishes come true. "It's my best Christmas gift ever," said Dusty Fleming, student. 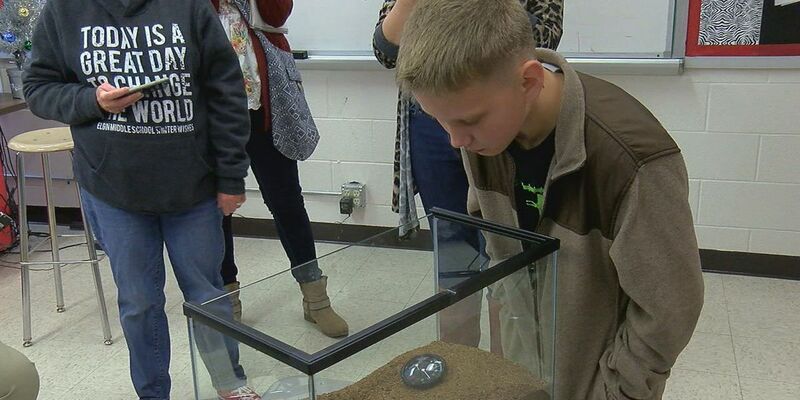 7th grade student Dusty Fleming was just one student that received the first wish on his Christmas list. That was a blue-footed baboon tarantula. Dusty said he had a tarantula when he was younger, but had to get rid of it once he moved from his mother's house to his fathers. He said his first one was nothing like this one. "It goes and burrows and catches its prey and stuff," said Dusty. "I always wanted one like that." Student council president Charles Carter said students like Dusty deserve to have their wishes fulfilled. "You never know how some kids have life at home and you really just want to bring the happiness to everyone and Winter Wishes is a great way to do that," said Charles. EMS teacher Melissa Evon said their motto this year is "more kindness than necessary," which is what she hopes students will learn through the program. "Our community has been kinder than necessary to us and we want them to see that kindness has a ripple effect," said Evon. "That it passes forward and passes on." As for Dusty, he plans to take his new friend home to love and care for it. He wants his fellow student, faculty and the community to know how much he appreciates them making his wish a reality. "I really like it and I can't thank you even more," said Dusty. "I don't know how much I can thank you for this."